Cheeky was supposed to be killed along with thousands of other hens. This is standard practice after their bodies give out from laying far more eggs than is natural. 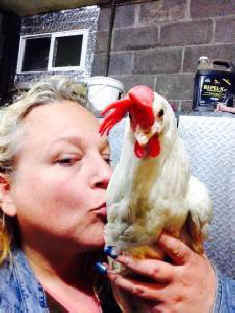 Instead, she was spared this fate and traveled from California to New York in a plane with 1,150 other rescued hens to various sanctuaries on the east coast. Catskill Animal Sanctuary welcomed 200 of the ladies to their new home. 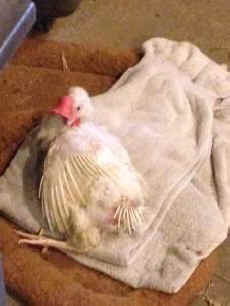 Once they arrived I treated them for issues and one little featherless girl had a swollen cheek. She ended up having an oral infection that I treated and referred to her as the cheeky chicken. The name Cheeky stuck. Cheeky often visited the kitchen for a treat from Jenn. She lived in the kitchen and after time became beautiful with full feathers and a personality that was unmatchable. She answered me when I called her, ran for me, and chased cats. She even began to crow when she became the self-proclaimed boss of her flock. This chicken was the one animal that if I were ever to part ways from CAS I most wanted to be sure was in my life. Monday morning Cheeky was fine, she was eating blueberries and enjoying herself. Monday evening she fell ill. I held her, medically treated her, and shared hugs, love, and support to heal my girl. Unfortunately, this evening Cheeky chicken has passed. SSome of you may not be able to understand how this can make me so sad, but she was an amazing bird with a hell of a story and will. She touched me so deeply. As I go to bed tonight I will shed many tears and miss her. I will also thank the holy spirits for bringing this amazing teacher, friend, and colleague into my life. I love you baby girl. Go frolic with Hank and teach Miracle how to be an incredible chick! !